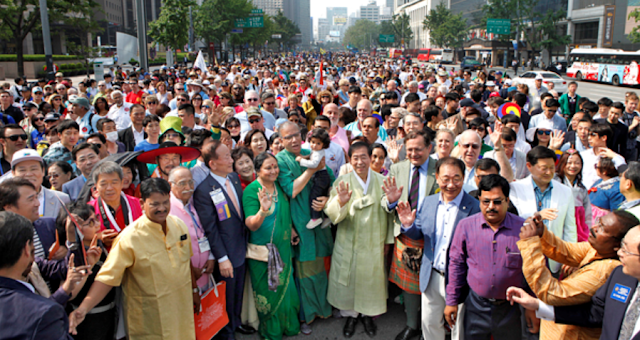 Joined by citizens and senior diplomats alike, thousands of Rotarians clad in traditional dress waved flags and marched through Seoul on Saturday to wish for peace on the Korean Peninsula and beyond. The 3-kilometer (1.8-mile) peace walk with some 5,000 Rotarians, or Rotary club members, from over 60 countries commenced the five-day Rotary International Seoul Convention. “Seoul is excited to host a festival for Rotary International, celebrating a history of over 100 years with 1.2 million members,” said Seoul Mayor Park Won-soon, sporting a jade green hanbok, or traditional Korean attire, while addressing the crowd at Seoul Plaza. Parading alongside a traditional Korean instrumental ensemble and royal procession, the Rotarians sang their national songs and waved their countries’ flags as they passed Cheonggye Plaza and the Statue of Admiral Yi Sun-shin before arriving at Gwanghwamun Square. Ambassadors and senior diplomats in Seoul joined the cause. Sanchez and her fellow Chilean Rotarian Rosa Gueren waved their handkerchiefs in the air to demonstrate la cueca chilena, a national dance of the country. “Little ambassadors of our country, that’s who we are,” said Yolanda Ibarra, a 17-year-old from Mexico participating in the Rotary Youth Exchange program in Korea. Ibarra and her two colleagues from France proudly wore blue jackets covered with pins and badges traded with other students or acquired in each country they visited. Groups of Korean students also stood out among the crowd in their matching school uniforms. “It’s great to see the rest of the world getting together to wish for peace,” said Lee Da-hee, 17, an Interact member who attends Sungshin Girls’ High School in Gyeonggi. Interact clubs are Rotary-sponsored community service clubs for those aged 12 to 18. In Seoul alone, there are 731 Interact clubs and 202 Rotaract clubs.